Note that this is a Federal Reserve Note, a debt note of the United States to the Federal Reserve, not a United States Treasury note, nor is it backed as Constitutionally required by gold or silver. The Federal Reserve is a privately held central banking establishment, which releases to the public and controls the market value of all currency of the United States. It is in fact not Constitutional money at all, but fiat money having no basis of value whatever except the debt that the Government and the public have created through over-spending and credit. See Who Is Running America? Or go to your library and check out "Secrets of the Temple - How the Federal Reserve Runs The Country" by William Greider... it is a long read, 766 pages, but every citizen should know about it. None-the-less, the symbology relating to our nation, as we look on the front of the bill we see "The United States of America" to remind us of our Great Nation in which we live, and the portrait of George Washington, our commander-in-chief during the War for Independence, in which so many dedicated men gained our freedoms and liberty for us and our posterity. He was the first president under the Constitution for the United States, the Supreme Law of The Land, which establishes and limits our form of government and protects our rights as Free Sovereign Citizens. We also see the United States Treasury Seal. On the top of the seal we see the balanced scales representing justice and equality among all our citizens. In the center is a chevron with 13 stars representing the 13 original colonies. Underneath is a key used as a symbol of authority. That's all pretty easy to figure out, but that which is on the back of the dollar bill is something every citizen should know. If we look at the left-hand circle, we see a Pyramid. Notice the face is lighted, and the western side is dark. This country was just beginning. We had just begun to explore the West. We did not yet know what we could do for Western Civilization. The Pyramid is uncapped, signifying that the work of our nation is not finished. Above, in a capstone not yet in place, we have the all-seeing eye, an ancient symbol for divinity. It was Franklin's belief that one man couldn't do it alone, but a group of men, with the help of God, could do anything. 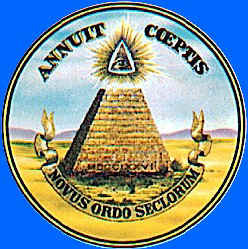 The Latin above the pyramid, ANNUIT COEPTIS, means, "It (The Eye of Providence) has favored our undertakings" The Latin below the pyramid, NOVUS ORDO SECLORUM, means, "A New Order for the Ages." At the base of the pyramid is the Roman Numeral MDCCLXXVI, 1776, the year our independence was declared. "IN GOD WE TRUST" is centered above the ONE dollar denomination of this bill, ever reminding us of the "ONENESS", the UNITY of All Mankind under GOD. If we look at the right-hand circle, we see the Great Seal of the United States. It is on every Federal Office Building and National Cemetery in the United States. It is the centerpiece of most hero's monuments. 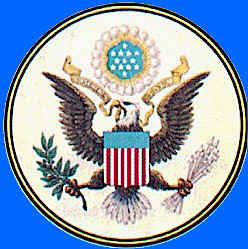 Prior to 1945, modified with the Eagle looking to its left toward the arrows, it was the seal of the President of the United States, as commander-in-chief of the Armed Forces. Since the change ordered by President Harry Truman in 1945, the Eagle always looks to the right toward the olive branch. The presidential seal is always visible whenever he speaks, yet very few people know what the symbols mean. Here are the obverse (front) and reverse (back) of the Great Seal in color. The Founding Fathers made an appropriate choice when they selected the American Bald Eagle as the emblem of the nation. 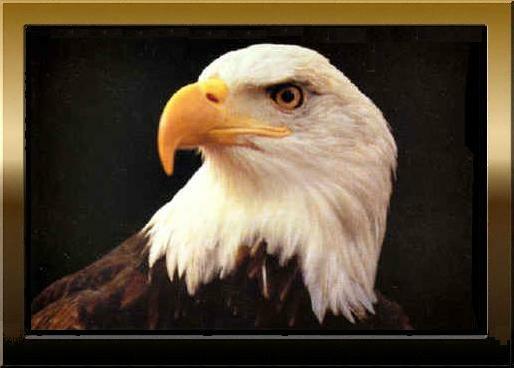 The fierce beauty and proud independence of this great bird aptly symbolizes the strength and freedom of America. Secondly, he wears no material crown. We had just broken from the King of England and all ties to any form of "nobility." Also, notice the shield is unsupported. This country now stands on its own. At the top of the shield we have a blue field, representing Congress, a unifying factor. The colors are taken from the American flag and officially, the red represents hardiness and valor, the white represents purity and innocence, and the blue, vigilance, perseverance, and justice. We were coming together as one nation. On the ribbon in the Eagle's beak we read, "E PLURIBUS UNUM," meaning, "Out of Many, One." We see that the eagle holds an olive branch in its right talon and a cluster of arrows in its left. The official meaning is that the olive branch and the arrows "denote the power of peace and of war." The Eagle "For those who say I represent power and might, I tell you that is not true. I stand more for harmony, peace, and height, freedom, soaring spirit and simple joys. Yes, I have strength, but it is so I can nourish my children nested high in the hallowed arms of Earth. "Let me be for you a living reminder, a messenger of Unity from the ancestors of this land, and for all who would transform the red dust into the sacred circle. This is the meaning of the Latin words on the scroll I carry. E Pluribus Unum, Out of Many, One. You are one with your ancestors, one with your descendents, one with all the creatures of land, sky, and water - even with the rooted ones. Remember this, and your heart will soar with the spirit of the Eagle." Above the Eagle, we see thirteen stars, representing the thirteen original colonies, and any clouds of misunderstanding rolling away. Again, we were coming together as one. Notice what the Eagle holds in his talons. He holds an olive branch, symbolizing PEACE and arrows. This country wants peace, but we will never be afraid to fight to preserve peace. The Eagle always wants to face the olive branch, but in time of war, his gaze turns toward the arrows. Some say that the number 13 is an unlucky number. But think about this: 13 original colonies joined in signing the Declaration of Independence, 13 stripes on our flag, 13 tiers on the Pyramid, 13 letters in the Latin ANNUIT COEPTIS above, 13 letters in E PLURIBUS UNUM, 13 stars above the Eagle, 13 bars on the shield, 13 leaves on the olive branch, 13 olive fruits, and if we look closely, 13 arrows. And to maintain honesty and allegiance in our elected representataives, civil servants and indeed, the entire citizenry of the nation, the Original 13th Amendment to the Constitution, proposed during the administration of James Madison, the "Father of the Constitution", ratified in March, 1819, during the administration of James Monroe who declared the Monroe Doctrine of non-interference by European powers in the western hemisphere, and which amendment was surreptitiously "disappeared" from the published Constitution after 1876. I ask "Why don't we know this? Our children don't know this, and their history teachers don't know this. How then can they be taught?" "They can look at a United States One Dollar Bill"
All Americans should know that the Great Seal is their national emblem. Patriots honor and protect it, just as they do the Flag. Too many veterans have given up too much to ever let the meaning fade. Many veterans remember coming home to an America that didn't care. TOO MANY VETERANS NEVER CAME HOME AT ALL.